Private community with 2 private beach areas, boat slips for rent ($12/day), boat ramp, heated swimming pool, beach volleyball, children's area with playground, laundry facilities and more. Brand new, modern 30' travel trailer with beautiful outdoor area. Glamping experience in tastefully decorated, comfortable 2 bedroom trailer. 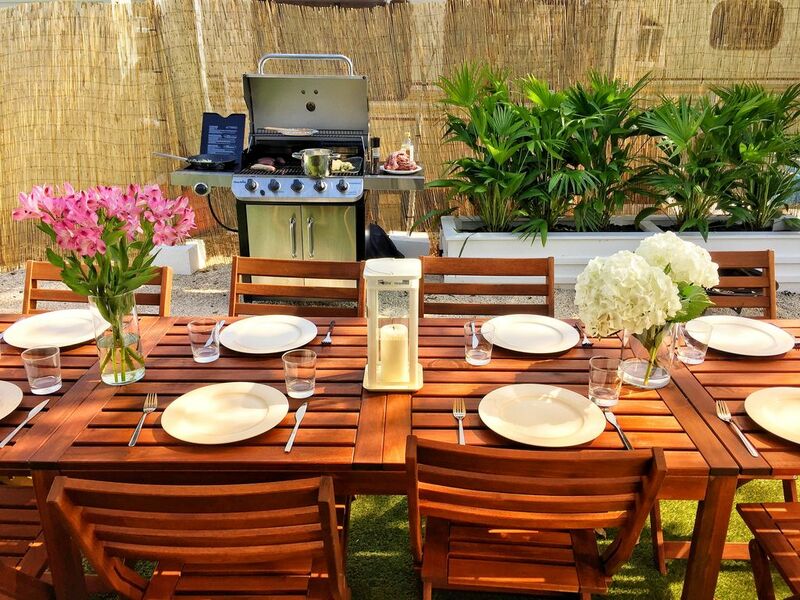 Cozy outdoor area with large dining table, lounge chairs and grill to enjoy breezy evenings under the patio lights. We have 3 paddle boards (free of charge). 2018 30' travel trailer with all the amenities and comfort of a house. Master bedroom with queen sized bed, 2nd bedroom with 3 twin sized bunk beds. The dining table can be converted into a double bed (48" x 77") and the sofa can be converted into a small futon bed for a child (40" x 59"). Kitchen has a 3 burner cooktop, medium sized refrigerator, and microwave. Kitchen comes equipped with plates, drinkware, pots and pans, utensils, flatware and anything else you may need to prepare meals at home. The bathroom offers a bathtub/shower combination. Towels and linens are provided. 2 Large sized smart TVs with cable, one in the living room and the other one in the master bedroom. Free wifi internet. Washer and dryer in the campground. toilet, tub, RV- SO NO PAPER IS TO BE FLUSHED DOWN THE TOILET! This was not as presented. It is not a brand new trailer given its condition — stains on upholstery, nicks on woodwork. AC was not turned on when we arrived so trailer was stifling and it smelled. We went in, look around and decided we could not stay there. There are much better places to stay, with better settings, for less money in Kay Largo. Representatives have been unresponsive to our efforts to contact them. Avoid this one. 1. Unit had not been cleaned upon arrival; cleaners showed up about 5:15 but did a good job. 2. Range/oven would not light. As discussed in 'The Manual', turned on the right -hand tank valve, but nothing changed. I suspect both tanks are empty. Had to borrow a butane lighter since the one in the RV didn't work either! 3. Outside grill worked perfectly. 4. Unit was very clean; looked in new condition. 5. Several wall attachment screws were about to come loose. Check towel rack screws and shower head screws. 6. Got lots of positive comments about the outside furniture. Newer trailer, good condition, close walk to the pool. Full size fridge/freezer,Smart TVs, outdoor area is very nice. Paddle boards are fun! Kampground is very clean, quiet, and perfectly located in the middle of town. everything you need is very close. The pool is very nice, wish it had a hot tub though. The clubhouse is perfect for any social gathering, and the other facilities were perfect for a short or long stay. Will stay there every year I visit the Keys!